Chelsea regained the lead against Fulham in the first half at Craven Cottage this afternoon, as Italian international Jorginho applied the finish to a great Blues counter attack. Having just been pegged back by Callum Chambers after taking the lead through Gonzalo Higuain, the away side soon found themselves in front again through a brilliant finish from Jorginho. 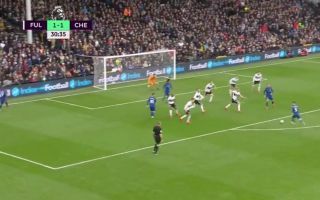 The goal came after a swift counter attack from Chelsea saw Eden Hazard lay the ball off to Jorginho, who fired home into the top corner giving the Fulham ‘keeper with no chance. You can check out the goal below. Absolutely lethal from Maurizio Sarri’s men!